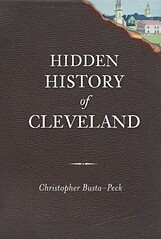 The other day, I was browsing Charles Whittlesey's Early History of Cleveland, Ohio, looking for something interesting to write about. I came across the following map, illustrating a "Ancient Fort" in Newburg Township. This consists of a double line of breast works with ditches across the narrow part of a peninsula between two gullies situated about three miles south easterly from the city on the right of the road to Newburg on land heretofore owned by the late Dr. H. A. Ackley. The position thus protected against an assault is a very strong one where the attacking party should not have projectiles of long range. On three sides of this promontory the land is abrupt and slippery It is very difficult of ascent even without artificial obstructions Across the ravine on all sides the land is upon a level with the enclosed space The depth of the gully is from fifty to seventy feet About eighty rods to the east upon the level plain is a mound ten feet high and sixty feet in diameter At the west end of the inner wall is a place for a gateway or passage to the interior. The height of the embankment across the neck is two feet and the enclosed area contains about five acres. Perpetual springs of water issue from the sides of the ravine at the surface of the blue clay as they do at Cleveland. 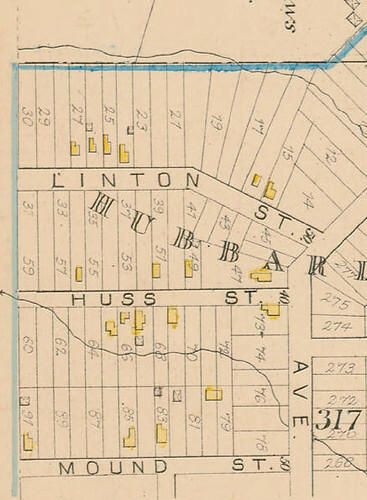 I began by checking the 1858 Hopkins map which showed that the land owned by Dr. Horace A. Ackely was located south of Broadway, between East 55th and East 65th Streets. This is further corroborated by the presence of streets named "Ackley" and "Mound". The problem is that the landscape shown in Whittlesey does not correspond at all with what is present today. The stream shown in the picture, Morgan Run, has been culverted, and the gullies, bulldozed flat. I thought perhaps in another historic atlas might show the location of the stream, which would give me a starting point. The 1881 City Atlas of Cleveland Ohio gave me what I needed. The stream isn't a perfect match, but it's the best approximation of the general shape that I've been able to find. It still remains to correspond the historic geology with modern roads. 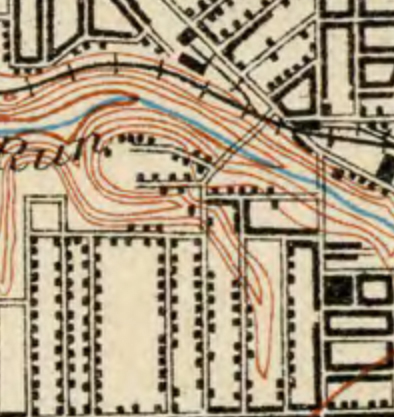 A solution to this problem was found in this turn of the century USGS topographical map, found on Rails and Trails. I visited the area, looking for anything that my might look even faintly mound-like, but alas, there seems to remain no physical evidence of either the defensive mounds or the circular one to the east. It seems to me that what kind of earthwork we have here near present-day Mound Avenue, to clarify, was not a burial mound as built by the Adena and the Hopewell Peoples who occupied Ohio at periods between 1000 BCE and 1000 CE. The Adena and Hopewell are known as the "Moundbuilders". This site near Mound Avenue is one of the earth fortifications of the so-called Whittlesley Indians unique to our region. They flourished from about 1000-1600 BCE but never contacted Europeans. They occupied territory between the Erie Indians to the East and Sandusky culture to the West. This is not to say there was not in fact an active Hopewell culture in NE Ohio in the proper time period for this culture; there most certainly were. For example there is a Hopewell burial site at Everett Knoll near Riverview Road in the Cuyahoga Valley. Also even though mound burials among Whittlesley people were rare, there is at least one Whittlesley burial mound in NE Ohio according to sources I have perused. For more information see the archeology writings and investigations of David Brose from the Cleveland Museum of Natural History. An afterthought....I am really curious about the mound, according to Whittlesey quote above, "80 rods to east." of the "breast works" Not knowing how far 80 rods is, let alone one rod, I didn't consider it. This mound is also missing from Whittlesey's picture, and just a dot in your picture, Chris; I missed it at last comment. I now am reading Whittlesey's 1871 book "Ancient... Forts" which clarifies that 80 rods is 1/4 mile. Whittlesey also says by the time of writing of "Ancient ... Forts", the mound in question had largely been flattened. More recent archeological writings indicate all earthworks in SE Cleveland (formerly Newburg Township) and presentday Cuyahoga Heights are no longer visible. No writing I've yet seen seems very clear on the vintage or purpose of this mound, defensive or otherwise, Hopewellian or in the late Woodland Whittleleysian tradition (1200-1600 AD).